Film is something you can see, isn’t it? You cannot capture things you cannot see and turn them into film. Why is Urutora ai [Ultra Eye]1 boring? Actually no, while you’re watching it, it’s amusing. But, immediately after, you forget about it. In the end, it’s because they show something you cannot see, but which has been designed so that you would be able to see it. 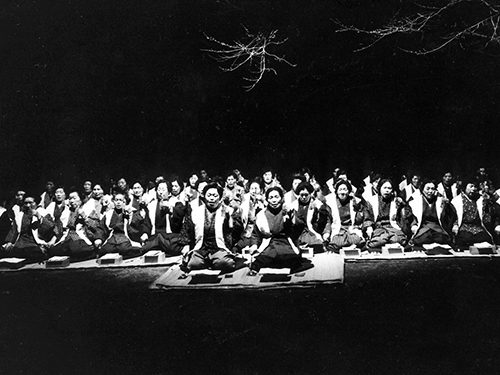 Film, on the other hand, shows what cannot be seen only through images of what can be seen. For example, let’s take the scene we edited today, the scene just before the title sequence. First you see the “blooming of the rice plant” in a rice field, followed by the “fertilization of the rice”. It means that we jump from one thing to another. While the “fertilization” is shot indoors with a camera fixed to a microscope, the preparation of the shot is omitted, and we are instantly shown just the result. 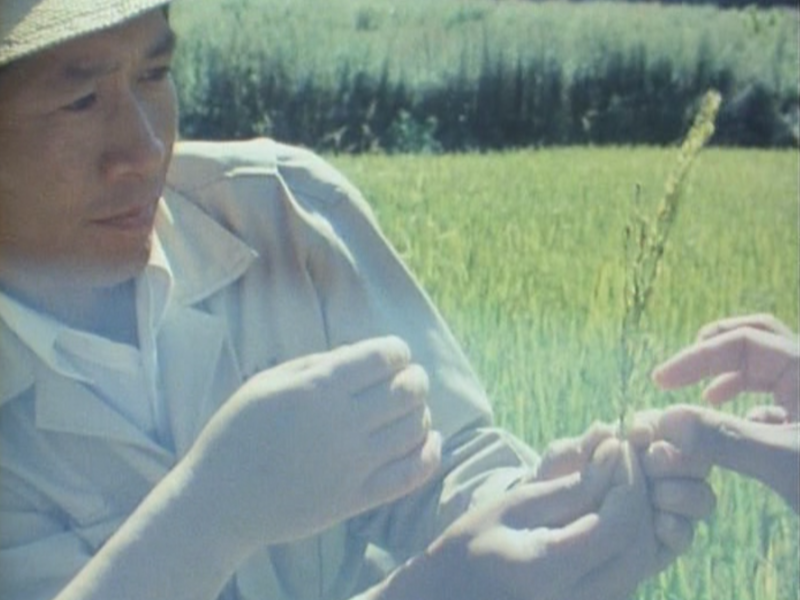 But suppose that, after the “blooming” shot, another image was inserted of naked stamens being placed upon a microscope slide, onto which pollen is sprinkled with the words “Ready, start”, then in all likelihood the spectator would understand that this is how the fertilization of the rice was filmed. And if “fertilization” then occurs, it becomes merely an explanatory shot, namely, a “result”, and all charm is lost. The spectators will be bored. Film is something in which you are continually shown something, isn’t it? People who watch films each understand the images from their own point of view, translating them into their own time. That’s why cutting down or omitting an image sometimes means to betray the point of view of the spectator. To align this idea with the example above, you see the blooming of the rice plant in the rice field and if that subsequently shifts to the appearance of the fertilization shot with the microscope camera, I think nobody would have foreseen that. The way we have edited it today, the moment we jump from one shot to another, what do people then feel when they see that? They intensely feel our burgeoning gaze and our point of view of closely observing the rice. Things like the feelings or the concentration when we were continuously observing the rice plants in the rice fields aren’t “something you can see”, are they? We see the sequence with the succession of scenes “blooming to fertilization” through the point of view of cameraman [Masaki] Tamura. But in reality we cannot see “the fertilization taking place” in his eyes. Because that is precisely something that is in the mind of Tamura. But the spectators see it as something that Tamura is seeing right now. And that way, what becomes visible at that moment is the passing of time Tamura feels there. In other words, the light there, the heat, the smell of heaped up rice plants. If an image of the different phases had been inserted, then the “invisible” wouldn’t come across for the people watching it. Because then the whole process would come to a halt with a scene that merely explains it. And that is exactly what Ultra Eye becomes. This time I want to make a film that from beginning to end approaches “things you cannot see” through “things you can see”. 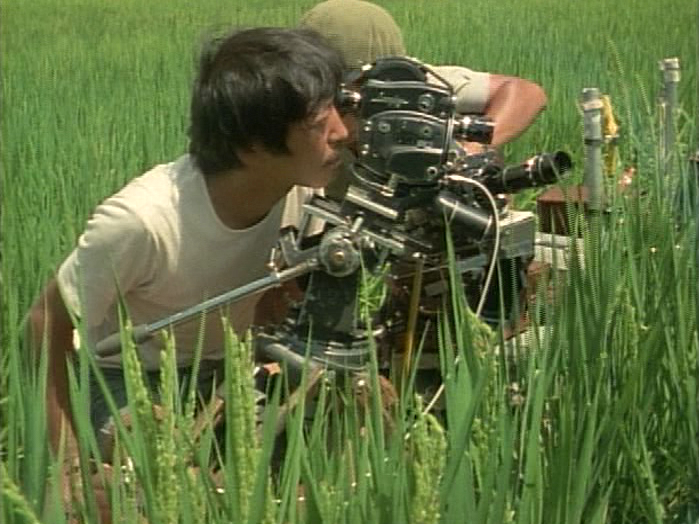 The editing that starts tomorrow will be with the scenes in which we follow “rice plant – field” the whole time. While working on these scenes, we will also address “the two stories of the Horikiri shrine” [for the Goddess of Mercy]. 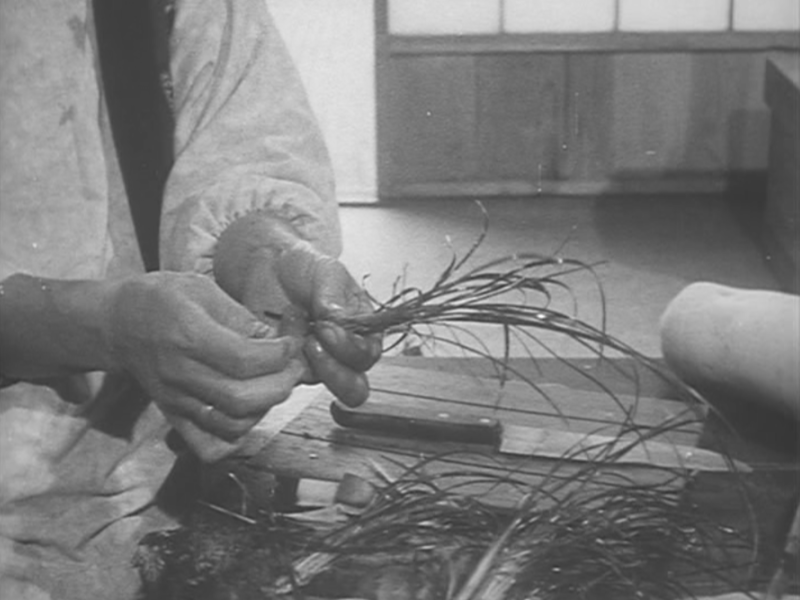 Just now, when I looked at the rushes of tomorrow’s part after the title sequence (today we mainly edited the scene before the title “summer – blooming” and tomorrow we plan to edit “autumn – quantity of the harvest” and “winter – our field”), I thought that if we would link it to “our field”, it would be the same as in Nippon koku: Furuyashiki-mura [“Nippon”: Furuyashiki Village]. I feel that I now start seeing the difference between “Nippon”: Furuyashiki Village and this film. In “Nippon”: Furuyashiki Village, the explanatory scenes are mostly situated in the first half of the film. There we present “the frost damage” by repeating successive images. It is persuasive, but there are parts that compel the viewer to show patience. I’m not saying that’s bad, I just want to convey a different, lighter way of telling a story, right down to the last detail, this time. So I think that we shouldn’t follow the order (every layer of soil, soil analysis, ground analysis, etc. of all the research sites A-B-C-AA) for “our field” as well and that we shouldn’t follow the whole process and link everything together, but that a bold jump is necessary, like taking site A and site AA as representative for all the sites in “our field”. Or what if we were to place the scene of “our field”, filmed indoors using an illustration in the episode “research of the groundwater level”, after the scene when the snow suddenly falls and a sharp wind blows and in which [Sadatoshi] Mikado and [Toshio] Iizuka both are blown away when they walk on the field. That scene, first of all evoking “the origins of our field”, begins with a picture of the rice field of long, long ago, and subsequently there are colourful images of “our field” on numerous screens, right? There, using diagrams with cel overlay2 of the successive years 1976, 1977, 1978 and 1979, using pictures of the sites of the events, and using numbers indicated on the pictures, what comes across is the research into the state of the water drainage, the analysis of the relationship between the water drainage and the quantity of the harvest, the improvement of the water drainage by digging ditches, etc. There, the sense that we have started to consider the soil as our partner comes across. Seeing the scientific methods that enter into this – research, analysis, overall insight – with our own eyes, we could also say that we uncover one rice field. One rice field is nothing more than one heap of soil. But it is a lot of things. We are not going to explain everything successively, but rather pull it apart and uncover it. We are not going to amass but omit images. Of course, even the image of “our field” on the picture, depending on how we use it, could only amount to an image of us merely explaining our rice field. If the image doesn’t unfold, when we jump from one cut to another, that would really be a failure. But if it goes well, we could present the exact existential sensation of the mass of soil of our one rice field as it is to the people who watch the film. I think that the sequence of “rice plant – field”, that we are going to edit in its entirety starting tomorrow, will go smooth; “the image that uses the picture” will come in the middle, and if it works out, it will be a bridge and it could come within “the two stories of the Horikiri shrine”, starting with Mr Satake. That moment may heavily disturb the gaze of the spectator. But maybe because of that jump, he or she will probably suddenly sense the rice field profoundly. That is what was especially difficult today when we edited the main roll, because I think that, by inserting scenes in that way, all the different methods of this work are present. We didn’t use one image or cut in an explanatory way. But it should actually still be an explanation. We should have well made “visible” the “invisible things” that we experienced while closely observing the rice plants. 1. Very successful non-specialist scientific television series made and hosted by Shizuo Yamakawa between 1978 and 1986. 2. A technique also used in manga and anime. Unpublished. 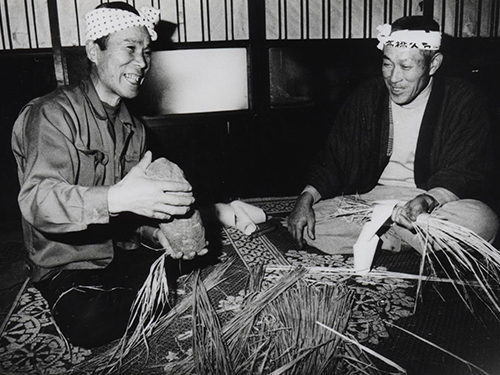 Ogawa in Magino, personally told to the crew on 21 February 1986, during the editing of Sennen kizami no hidokei – Magino-mura monogatari [The Sundial Carved with a Thousand Years of Notches – The Magino Village Story]. Kanai Katsu: Then there’s Furuyashikimura, which I really like. What was it like making a documentary after such a long time?